The feast of Saint Stephen was commemorated on December 27, 2017 at Holy Apostles with the morning matins prayers followed by the Divine Liturgy. On this particular and quite special day the services were presided over by Father Stephen Powley, Presiding Priest at Saint John the Baptist Orthodox Christian Church in Pueblo, Colorado. 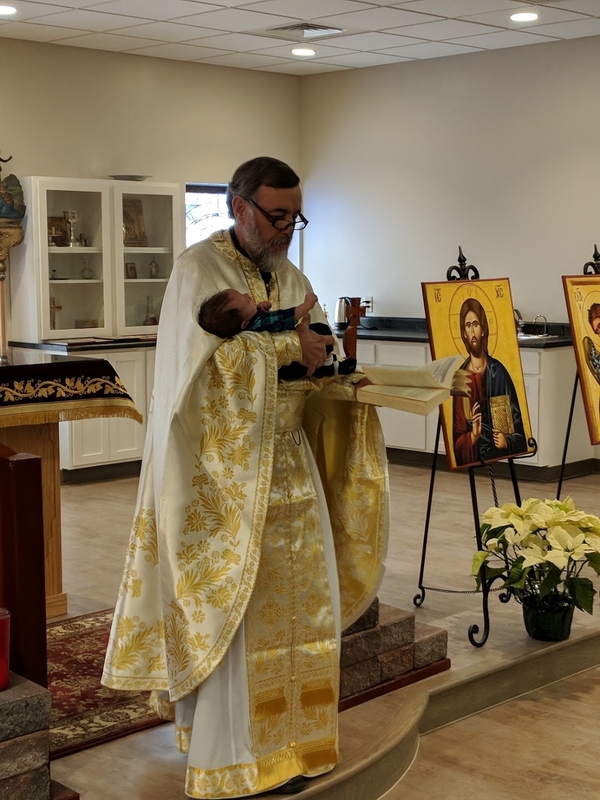 Father Stephen, whose nameday it was, along with his beloved wife, Presvytera Ashley joined the parish as their grandson, Symeon was presented into the church for his 40 day blessing. Greg and Tara Pappas, Symeon’s parents offered their son to God as was done throughout Holy Scripture and the history of the Orthodox Church. Tara Pappas, Father Stephen and Presvytera’s daughter is a proficient byzantine chanter. May our Lord grant them all many years of health, joy and blessings! The 40-Day Blessing Explained: The ceremony of the 40-day blessing, also called, churching, marks the time when the mother, having recovered physically and emotionally from the birth of her child, and having re-ordered her life around the child's care, will resume her life in the community of the Church again. She comes to the church with her child, accompanied by her husband, to offer her thanksgiving for her child, and coming in contact with the life-giving glory of God, she asks for the forgiveness of her sins, despite her human weakness, so that she may be `worthy to partake, uncondemned, of the Holy Mysteries,' that is Holy Communion, once again. This ceremony, follows that of the Old Testament to which the Mother of God submitted, conducted on the fortieth day after the child's birth, but may also take place as close to the fortieth day as possible. God in His wisdom ordained that a period of 40 days lapse following childbirth before the mother resumes her life in the community and church. During the churching, the priest, in imitation of the elder Symeon (Luke, Chapter 2), takes the child up to the sanctuary, making the sign of the Cross with the baby and reciting the prayer of St. Symeon. Again, inspired by the example of Symeon's encounter with the infant Messiah, for each child has the potential to be great in the sight of the Lord, the act of churching recognizes this and also serves, as with the mother, to introduce the child to the community of faith. "Lord, now let Your servant depart in peace, according to Your word; for my eyes have seen Your salvation, which You have prepared before the face of all people, a Light to enlighten the Gentiles, and the Glory of Your people of Israel."